Prime, bond, and desensitize in a single step. This one-bottle, light-cured, ethanol-based 5th generation adhesive bonds composite and amalgam to dentin; also bonds indirect restorations (ceramic crowns, inlays and onlays) when used with light cure or dual cure luting cements. Contains: 3 x 4ml bottles adhesive, 150 applicator tips, reusable mixing well. Gluma Comfort Bond + Desensitizer earned 4.1 stars out of a possible 5.0. Adhesive and desensitizer in one simple bottle. By using the proven chemistry of Gluma Desensitizer (glutaraldehyde and HEMA) and 4-META in an ethanol/water solvent, this is a product that not only performs well, but is also less technique-sensitive than some of its competitors due to its ability to bond under dry, moist, or wet conditions. Even the application method and curing time do not seem to affect its performance very much. In addition, it registered a surprisingly high bond strength with the self-cure composite. Basic bond strengths were on the low end of the continuum and its cost is on the high end. The rather large head of the applicator in the single-dose may not fit into a small preparation very well. Name is descriptive but cumbersome. If you are still plagued with patients complaining of sensitivity and still prefer to use a total etch adhesive, this product could solve your problems. 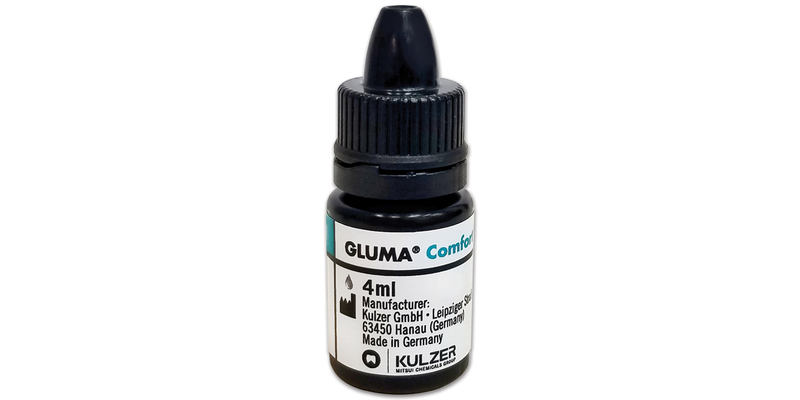 Since the publication of this review, Heraeus Kulzer has discontinued the single-dose delivery of Gluma Comfort Bond + Desensitizer.